And now we have a clear narrative against the Labour leader that he is a ‘backstabber’ who is even prepared to ‘stab the nation in the back‘. In their desperation, the Tory campaign is taking an extremely nasty turn indeed. Tom Pride here points out that the Tories’ claim that Ed Miliband is backstabber, is the same one that the Nazis applied to the Jews, in order to explain Germany’s defeat during the First World War. I think this is probably going too far. The fact that the insult’s the same need not necessarily mean that Rothermere is being deliberately anti-Semitic. On the other hand, this is the Rothermere press, which does have a long history of anti-Semitism. This gives some verisimilitude to Tom’s accusation. I can see your point with the Daily Fail blog but think you are stretching it too far with this one. 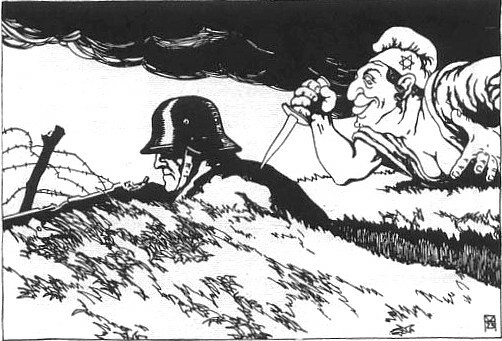 The term backstabber in my mind has more to do with Brutus and Caesar than Nazi propaganda. I am sure this theme has been used throughout history to vilify opponents and scare people into believing in fifth columns. That said, the idea the eldest child should have first dibs at any opportunity is quite childish. Perhaps it reflects the feudal mentality of the Tory old guard or servile sibling sentiments. Either way, it is also counter to the free market argument they espouse that all competition is good. ” stabbed in the back ” speeches made by Nazis. Maybe hapless Kosher Kid Ed Miliband should start to really worry whenCameron and his right-wing acolytes start talking about having Miliband and his left-handed minions “forcibly resettled”? will labour scrap the benefit cap and the localism act? “OI VAY ITS LABOUR ” POSTER WTF IS THIS? Where’s all this anti semitic crap coming from? chewie: Could the British poor perhaps be channelled (a better more euphemistic word than resettled) into smaller enclaves on the poor unfertile pieces of land in Britain, while Cameron (wearing a condom) lets the rich have all the posh condominiums and very the best land…. somewhat on the scale that Israel has been restricting and channelling the Arab Palestinians into smaller enclaves these last 70 years? are the labour party intent on doing anything about that, like scrapping the benefit cap and localism? come on… it was first used figuratively by Shaw in 1916.. and existed hundreds of years prior. just because the nazi’s usurped it doesnt imply its understood meaning today. Actually for the Nazis those responsible for the ‘stab in the back’ we’re not simply Jews but anyone who hastened the end of the First World War. They were also known as the ‘November criminals’, and included many socialists and communists. The message the Mail is trying to put across here is that the Left is inherently treacherous. Somewhere I read the pundits are predicting about 277 Labour seats and 264 Tory seats, in this coming most severe hung parliament in May. This means the Tories can stay in a caretaker government for the next 5 years. Voting different for other parties means no such thing as a small party this time, in this vote or starve election. Don’t understand how that “despicable” comment got by the Speaker either.